Building your own cabinet for a home-built theremin or other music device? Some woodworking may be in order. 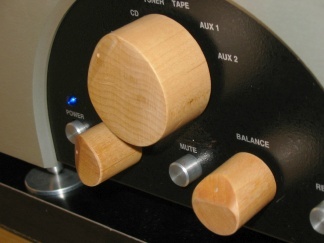 Scott Sims contributes a great wooden knob tutorial for the all-audio DIY site AudioTweaks. (via thereminworld) The bad news (for some of you) is, you’ll probably want a drill press. Check out this gorgeous tube project Scott worked on: there’s nothing like wood and tubes.